Designation: The Mina & Everard Goodman Faculty of Life Sciences, Bar- Ilan University. List of Author(s): Pablo Carmanchahi, Antonella Panebianco, Yu Jun, Adriana Suarez, Pablo Gregorio, Chen Sherman, Yosef Steinberger. Copyright: © 2018 Carmanchahi P, et al. This is an openaccess article distributed under the terms of the Creative Commons Attribution License, which permits unrestricted use, distribution, and reproduction in any medium, provided the original author and source are credited. Vegetation cover is an important factor in soil microbial community composition and activity. We compared the effects of dominant plantspecies cover in a semi-arid scrub environment in northern Patagonia. We compared indicators of a microbial community and activity under areas of Panicum urvilleanumand Neosparton aphyllumin La Payunia Provincial Reserve, Argentina. Soil parameters differed in their physicochemical components, playing an important role determining soil biotic compartments. Microbial community biomass and CO2 evolution react to changes in substrate availability determined by plant cover and soil pedological components. Our study showed that soil heterogeneity – plant cover – grazing activity interplay may be a main factor affecting soil microbial community function and is accountable to nutrient supply and soil stability. The high utilization of carboxylic acids, carbohydrates, and amino acids, and the difference in the ratio between them - are difficult to explain. The effect of plant cover, water-holding capacity, organic matter, pH, and soil properties on a soil microbial community could improve our understanding of the latter in low-production grazing areas. Better understanding of the patterns of soil characteristics and activity can facilitate environmental monitoring of the effects of wild guanaco (Lama guanicoe) populations, enhancing effective reserve management practices. Grazing, Lama guanicoe, Pruning, Vegetation cover. Plants play an important role in the structure and composition of ecological communities as primary producers and by regulating the input and distribution of organic matter [1,2]. The decomposition of organic matter is regulated by soil microflora plus the soil micro/ mesofauna, which play an important role in determining the rates of nutrient immobilization and recycling, all of which are key processes that affect the primary productivity of ecosystems. The productivity of plants is related to climate, and primary production and plant species richness are typically enhanced by higher water availability. The association between plant species diversity, their below-ground organic matter dynamics, and the species richness of soil biota on local scales across a broad gradient in the La Payunia semi-arid desert, has received very little attention. The La Payunia Reserve area contains the largest Lama guanicoe population (26,000 individuals) in the world . That large population of herbivores consumes a large but unmeasured fraction of the net aboveground primary production. According to Puig et al. , the L. guanicoe diet includes seventy-seven plant species, where the ratio between grasses and shrubs are changing with the altitudes. The proportion of grasses, mainly the Poa spp., are known to dominate (over 50%) in L. guanicoe diet consumption relative to shrub cover in a natural system. By grazing and pruning activity, the herbivory community affects the input of organic matter to the soil. Due to the great importance of soil microbes in key ecosystem processes, and their physiological complexity, which determines their ability to metabolize different organic compounds , basic knowledge of the functional diversity of soil microfloral communities over the entire range of the climatic gradients of two dominant perennial plants, i.e., Panicum urvilleanum (tupe) and Neosparton aphyllum (solupe) , is needed. Ecologists have long considered abiotic factors to be important drivers of the structure and function of biotic components. The distribution of nutrients, plant debris, and soil biota in soil systems is highly heterogeneous, especially when open spaces between plants are compared with microsites under plants. There is less microbial biomass in open-space soil due to low populations of microbes when compared to microbial biomass under plants. However, soil communities in open-space soil might be more diverse, as shown by Huston , who reported that low population density can result in increased diversity. Herbivores, such as Lama guanicoe, reduce plant biomass by grazing and/or browsing and trampling. These activities affect decomposition and the activity of soil microbes. Many of the characteristics of the plant community are likely to influence microbial functional diversity, biomass, CO2 production, and vice versa [8-10]. We examined the effect of a perennial grass, P. urvilleanum, and a perennial shrub, N. aphyllum, on soil microbial functional diversity at the northwestern and northeastern portions the La Payunia Provincial Reserve, Patagonia. Three areas characterized by similar plant cover were selected at each site. The two sites were selected based on their geomorphological components. Vegetation at the northwestern site consists of high shrubland situated on sandy-soil grass steppe plains. At the northeastern site, vegetation is low shrubland and high grassland located on sandy soil and scoria (basaltic) plains. The objective of this study was to determine the changes in soil microbial-community-level physiological profiles (CLPPs) at the upper soil layer (0-10 cm) in the vicinity of P. urvilleanum, the most widespread grazed grass, and N. aphyllum, an abundant browsed and endemic shrub in a desert system, representing two geomorphological and phytogeographical regions. We hypothesized that (1) the perennial grass and perennial shrub will have different effects on soil microbial functional diversity due to their different ecophysiological adaptations; and (2) microbial functional diversity will be correlated with the abiotic soil parameters. The study area is located in northern Patagonia, centralwest Argentina (between 36º00’ and 36°36’ S, and 68°34’ and 69°23’ W), and includes part of the 664,100 hectares of the La Payunia Reserve area. A gently undulating relief and vast flatlands, combined with areas of steeper hills and volcanic outcrops, dominate this area. The climate is continental desert, with mean temperatures of 6ºC in winter and 20ºC in summer, mean multi-annual precipitation of 198 mm, and an elevation range between 1400 and 1700 a.s.l. According to Carretero , the vegetation is xerophytic, with 58% of the site coverage belonging to La Payunia phytogeographical province in the Andean-Patagonian domain. The herbaceous communities in the plains are dominated by Panicum urvilleanum, Stipa speciosa, and Sporobolus rigens, while slopes and basaltic scoria are mainly represented by Neosparton aphyllum and Ephedra ochreata shrub communities, which cover sandy plains as well. This study was carried out at the end of summer at two study sites chosen according to the different landscape physiognomies at the north of the reserve, i.e., sandy plains and basaltic scoria. Our goal was to select plots representative of the natural landscape in this region. The soil samples were collected along a 180-km transect. At each sampling site, soil samples from the 0-10 cm depth were collected beneath the canopy of P. urvilleanum and N. aphyllum, and placed in individual plastic bags (n=4). All soil samples were placed in an isolated cooler box during transport to the lab. At the lab, the samples were kept at -4°C and sieved over a 2-mm sieve in order to remove stones and plant residue before chemical, physical, and biological analysis. Soil moisture (SM) content was determined gravimetrically by drying soil samples for 72 h at 105ºC . Soil water-holding capacity (WHC): One-hundred-gram dry soil samples were flooded with tap water in a bottomperforated vessel for five min. The WHC was inferred from the amount of residual water remaining following the infiltration of gravitation water. Organic-matter content was determined by igniting samples at 490ºC for 8 h.
Soil pH was measured with a glass electrode using a 1:2 soil:water ratio. Microbial biomass and CO2 evolution were detected using the MicroRespTM plate method . CO2 evolution was measured by dye plates – a colorimetric reaction using absorbent alkali with the ability to measure carbon dioxide evolution. The plates were read twice in a spectrophotometer at 590 nm: at Time 0 and one hour after that (Time 1). During that time, the plates were incubated in the dark at 27ºC. The result for each well was calculated compared to the 16th well, which contained the same soil sample and water, measuring the basal respiration with no carbon source at all. Glucose was added to determine microbial biomass according to the substrate-induced respiration method . The metabolic quotient (qCO2) was determined by calculating the ratio between basal respiration and microbial biomass. Shannon-Wiener index (H′): Analysis of community diversity was based on the equation H=Σ piln(pi), where pi is the proportion of species i in a sampling plot, and evenness (J = H/ Hmax), where Hmax is the maximum value of H for the number of species (S) present and Hmax = lnS) . The community-level physiological profile (CLPP) was detected using the MicroResp™ plate . Fifteen different carbon sources of carbohydrates, carboxylic acids, amino acids, and aromatic carboxylic acids (Table 1) were added to whole soil samples in deep well plates (0.07 g in each well). CO2 evolution was measured by dye plates — a colorimetric reaction using absorbent alkali with the ability to measure carbon dioxide evolution. The plates were read twice in a spectrophotometer at 590 nm: just before the plates were placed on the deep wells containing the ground (0.2 mm size) soil samples (time 0) and one hour after microbial respiration (which colonized the soil) (time 1). During that time, the plates were incubated in the dark at 27°C. The result for each well was calculated and compared to the 16th well (which contained the same soil sample and water), measuring the basal respiration with no added carbon source. Table 1: The different carbon sources added to soil samples and divided into chemical groups using the MicroRespTM technique. Data analysis: All data were subjected to statistical analysis of variance using the SAS model (ANOVA, Duncan’s multiple range test, and Pearson correlation coefficient) and were used to evaluate differences between separate means. ANOVA was followed by Tukey’s HSD (honest significant difference) test to establish the significance of differences between the plot areas using the statistical package Statistica 6.3. Differences obtained at levels of P < 0.05 were considered significant. In addition, redundancy analysis (RDA) was used to relate environmental factors such as, sampling site and sampling location with soil abiotic parameters and biotic variables, e.g., substrate utilization by using CANOCO, version 4.54 . The Monte Carlo permutation (499) test was used to calculate the significance of any given relationship established between the environmental factors and the measured soil parameters . RDA analysis produced graphic illustrations with arrows relating the environmental factors to their corresponding measured parameters. Arrows pointing in similar directions indicate a positive correlation, while arrows pointing in opposite directions indicate a negative one. The longer the arrow, the greater the significance of the relationship. Soil moisture levels showed significant differences between the two vegetation cover types in four out of the six sampling locations (Figure 1). The SM in the samples from all the NE sites collected beneath P. urvilleanum was (p<0.5) higher compared with the SM in soil collected in the vicinity of N. aphyllum. In contrast, at the three sampling locations at the NW site, the soil samples collected in the vicinity of the plants were found to show a strong heterogeneity. A comparison between the two sampling sites indicated a non-significant difference between the SM in the vicinity of P. urvilleanum, while the SM in the vicinity of N. aphyllum demonstrated significant (P<0.5) differences between the two sites. No significant effect of plant species, sampling location, and the interaction between them was found on soil moisture (Table 2). Table 2: Univariate analysis of variance (ANOVA) of soil abiotic and biotic variables in the soil samples collected in the vicinity of P. urvilleanum and N. aphyllum at the different locations, and the interaction between them. Changes in mean values (+SD) of soil moisture and organic matter in the vicinity of Panicum urvilleanum and Neosparton aphyllum at the six sampling sites and two locations (NW and NE). The six sites were CY – Cerro YPF; RA – Rincon Amarillo; and CA – Campamento – in the northwest location, and EZ – Entrada Zaino; PP – Pampa de los Pjaritos; and ZG – Zaino Guadalosos – in the northeast location. Letters signify Duncan’s multiple range test groupings (n = 4). Figure 1: Changes in mean values (+SD) of soil moisture and organic matter in the vicinity of Panicum urvilleanum and Neosparton aphyllum at the six sampling sites and two locations (NW and NE). The six sites were CY – Cerro YPF; RA – Rincon Amarillo; and CA – Campamento – in the northwest location, and EZ – Entrada Zaino; PP – Pampa de los Pjaritos; and ZG – Zaino Guadalosos – in the northeast location. Letters signify Duncan’s multiple range test groupings (n = 4). The OM pattern was different from the SM pattern, where soil OM values under P. urvilleanum were significant (p<0.5) in most cases at both sites compared with the values found under N. aphyllum (Figure 1), leading to significant (p<0.0001) plant species, location (p<0.0003), and species × location (p<0.001) effects (Table 1). The mean water-holding capacity (WHC) ranged from 35.9 to 45.4%, with no significant differences between the plants and sampling site locations (Table 2). pH values ranged from 6.4 to 7.5, with no significant differences between soil samples. However, a significant (0.0001) sampling location × sampling plant species interaction (p<0.0001) was obtained, with no plant species effect found (Table 1). Although the existence of a strong effect and different trends on species, location and interaction between the two were found, no positive Pearson correlation (P<0.05) was established between the abiotic components. 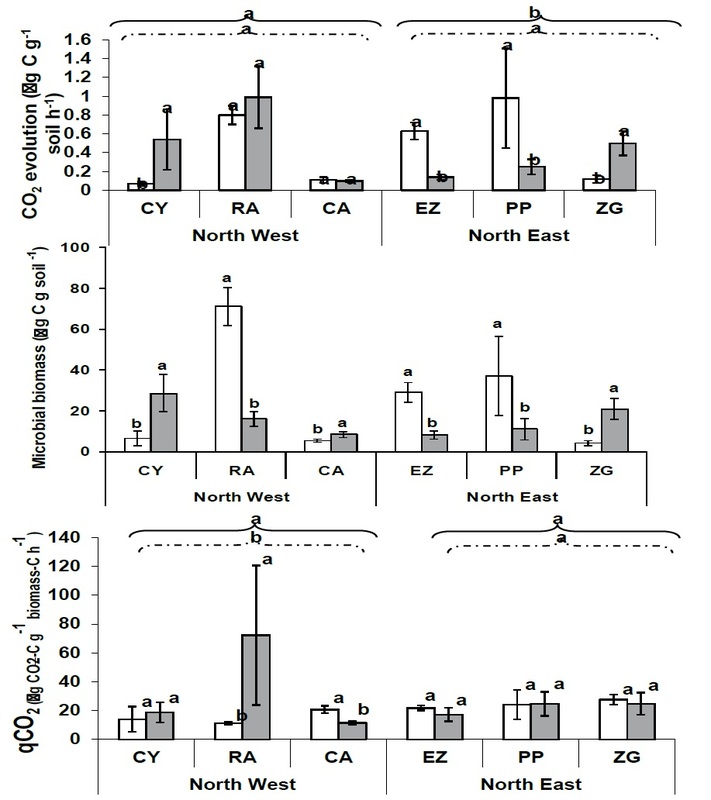 Microbial respiration (MR) was found to behave differently depending on the plant species in the NW and the NE sites, where at the NW site, the maximum P. urilleanum CO2 mean values reached 0.99 μg C g-1 soil h-1, values that were higher compared with CO2 evolution from soil samples in the vicinity of N. aphyllum (Figure 2). The trend for the NE was the opposite, with a maximum CO2 evolution in soil samples beneath N. aphyllum reaching similar values to P. urvilleanum of 0.98 μg C g-1 soil h-1. These differences between the two plant cover types yielded a significant (p<0.05) difference between the two sites (NW and NE) for P. urvilleanum, with no significant differences between the sites for N. aphyllum (Figure 2). Changes in mean values (+SD) of CO2 evolution (μg CO2 g-1 soil h-1), microbial biomass (μg C g- 1 soil), and qCO2 – metabolic quotient (μg CO2 -C g-1 biomass C h-1) in soil samples obtained in the vicinity of Panicum urvilleanum and Neosparton aphyllum at the six sampling sites and two locations (NW and NE). The six sites were: CY – Cerro YPF; RA – Rincon Amarillo; and CA – Campamento – in the northwest location, and EZ – Entrada Zaino; PP – Pampa de los Pjaritos; and ZG – Zaino Guadalosos – in the northeast location. Letters signify Duncan’s multiple range test groupings (n = 4). Figure 2: Changes in mean values (+SD) of CO2 evolution (μg CO2 g-1 soil h-1), microbial biomass (μg C g- 1 soil), and qCO2 – metabolic quotient (μg CO2 -C g-1 biomass C h-1) in soil samples obtained in the vicinity of Panicum urvilleanum and Neosparton aphyllum at the six sampling sites and two locations (NW and NE). The six sites were: CY – Cerro YPF; RA – Rincon Amarillo; and CA – Campamento – in the northwest location, and EZ – Entrada Zaino; PP – Pampa de los Pjaritos; and ZG – Zaino Guadalosos – in the northeast location. Letters signify Duncan’s multiple range test groupings (n = 4). These differences were significantly (p<0.0001) affected by sampling location and plant species – location interface (Table 2). The MR values were significantly and positively correlated with the pH and OM of the soil, but not with the SM (Table 2). Mean microbial biomass (MB) ranged from 8.11 to 28.63 μg Cmic g-1 soil in samples obtained in the vicinity of P. urvilleanum, and from 4.34 to 71.29 μg Cmic g-1 soil in samples collected in the vicinity of N. aphyllum (Figure 2). The difference between the lower and upper values of microbial biomass was 3.5 and over 15-fold for P. urvilleanum and N. aphyllum, respectively. A significant (p<0.001) difference was obtained for microbial biomass in the soil samples collected in the vicinity of the two plants along all sampling sites, where in half of the cases, P. urvilleanum was significantly higher, and in the other half, N. aphyllum was significantly higher. Although significant differences between the two plants were found, table 1 showed a strong and significant effect of location, sampling site, and the interplay between them. The metabolic quotient (qCO2) exhibited an interesting trend, where no significant differences were found between the sampling locations at the NE sites, while at the NW sites, 2 out of 3 sites exhibited significant differences (Figure 2). 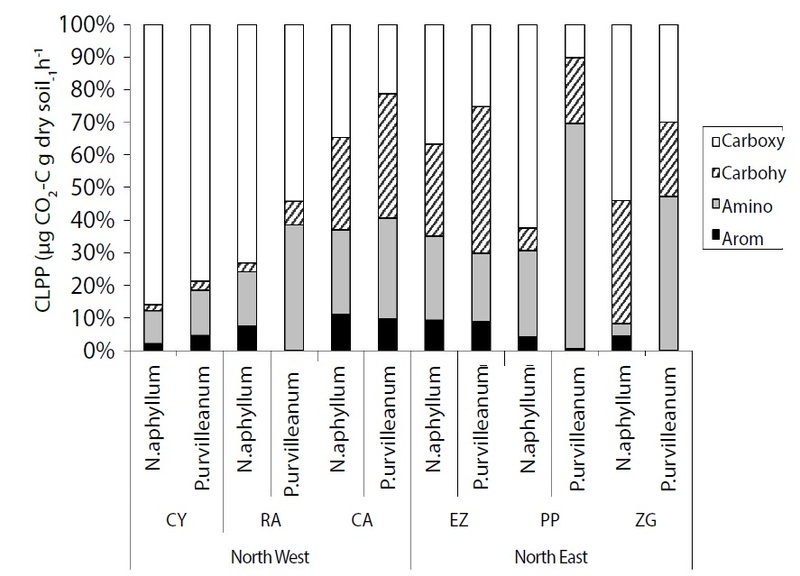 Significant differences between the NW and the NE sites were obtained only for N. aphyllum, where the location and the interplay between plant species and location were the ones that showed a significant effect on the metabolic quotient (Table 2). Shannon-Wiener index (H′): Analysis of community diversity ranged from 0.94 to 2.41 and from 1.47 to 2.62 for N. aphyllum and P. urvilleanum, respectively, yielding significant species, location and the interplay between the two effects. Mean values of the total CLPP substrate utilization rates for both plant cover types at each of the study sites (NW, 35.7 mg CO2–C g soil-1 h-1; NE, 12.7 mg CO2–C g soil-1 h-1) represented significantly (p<0.5) higher substrate utilization at the northwest site compared with the northeast site. The NW site exhibited higher substrate utilization in the soil sampled in the vicinity of P. urvilleanum, with a value of 15.9 mg CO2–C g soil-1 h-1, while at the NE site, the CLPP under the same shrub was 7-fold lower (1.8 mg CO2–C g soil-1 h-1). For soil samples collected in the vicinity of N. aphyllum, the mean CLPP at the NW site were 19.7 mg CO2–C g soil-1 h-1, while at the NE site, the values in the vicinity of the same plant were two-fold lower, reaching a mean of 10.9 mg CO2–C g soil-1 h-1 (Figure 3). 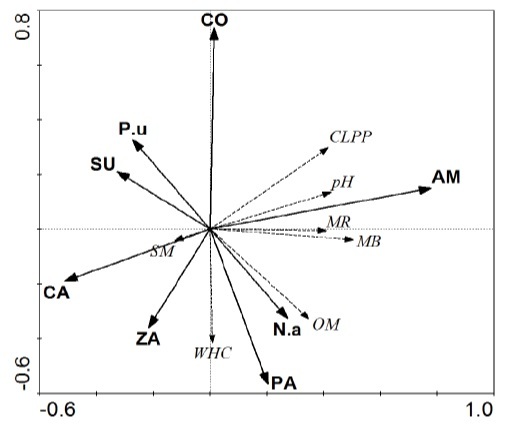 Community-level physiological profile [CLPP (%)] utilization for N. aphyllum and P. urvelleanum in the soil collected in the vicinity of the above-mentioned shrubs at the six different locations and two sites (CY – Cerro YPF; RA – Rincon Amarillo; and CA – Campamento, which are part of the northwest location, and EZ – Entrada Zaino; PP – Pampa de los Pjaritos; and ZG – Zaino Guadalosos, which are part of the northeast location). Figure 3: Community-level physiological profile [CLPP (%)] utilization for N. aphyllum and P. urvelleanum in the soil collected in the vicinity of the above-mentioned shrubs at the six different locations and two sites (CY – Cerro YPF; RA – Rincon Amarillo; and CA – Campamento, which are part of the northwest location, and EZ – Entrada Zaino; PP – Pampa de los Pjaritos; and ZG – Zaino Guadalosos, which are part of the northeast location). Significant differences in substrate utilization between the two shrubs were observed, where the P. urvilleanum soil microbial-community utilization rates exhibited a trend toward more amino-acid-based utilization, while the N. aphyllum soil microbial community exhibited a trend to utilize more carboxylic acids (Table 3). Moreover, the soil microbial community was found to utilize almost threefold higher amounts of amino acid substrates in the vicinity of P. urvilleanum (7.77 mg CO2–C g soil-1 h-1) compared with 2.93 mg CO2–C g soil-1 h-1) for the NW and NE sites, respectively. A similar trend was obtained for N. aphyllum, with values of 6.05 and 3.18 mg CO2–C g soil-1 h-1 for the NW and NE sites, respectively (Figure 3). Furthermore, the NW sites exhibited higher carboxylic substrate utilization in the vicinity of both plants compared with values obtained for the NE sampling sites: for P. urvilleanum: 19.63 compared with 0.91 mg CO2–C g soil-1 h-1 for N. aphyllum; and for N. aphyllum: 32.3 compared with 3.49 mg CO2–C g soil-1 h-1 (Table 3). No significant utilization was observed for aromatic and carbohydrate substrates, although aromatic substrate utilization was significantly (p<0.009) correlated with plant species, sampling location (p< 0.0001), and the interaction between the two (p<0.0001). Amino substrates were significantly correlated (p<0.02) with location and the interaction between plant species and sampling location (Table 2). The general trend was of enhanced substrate utilization between the plants, as well as between the sites (Figure 3), with all substrate utilizations expressed as the relative percentage of the total substrate utilization. Table 3: Pearson correlation coefficients between soil physical properties, microbial activity, and soil substrate utilization. Soil moisture – SM; soil organic matter – OM; microbial biomass – MB. All the variables that were not significant (NS) and not correlated, e.g., H', water-holding capacity (WHC), and qCO2, were deleted in order to make the table clearer. A general data analysis had showed a significant positive correlations between the SIR (substrate induced respiration) rates of most substrate groups, basal respiration rates, and microbial biomass at all sites and sampling locations were integrated (Table 4). Correspondingly, the evenness of substrate utilization was strongly positively correlated (P < 0.001) with basal respiration and (p<0.0001) microbial biomass. It is important to note, however, that the pH of the soils was significantly (p<0.001) correlated with both CO2 evolution and microbial biomass, while only organic matter was found to be significantly correlated (p<0.01) with CO2 evolution (Figure 4). It is surprising that no significant effect of soil moisture was observed, which can be due to the effect of the dry season, during which the samples were collected. Table 4: Mean values of substrate utilization (mg CO2–C g soil-1 h-1) of a microbial community in soil samples collected in the vicinity of N. aphyllum and P. urvilleanum at each sampling location and at each site of the La Payunia Reserve area. Sampling sites: CY – Cerro YPF; RA – Rincon Amarillo; and CA - Campamento are part of the northwest location. EZ – Entrada Zaino; PP – Pampa de los Pjaritos; and ZG – Zaino Guadalosos are part of the northeast location. Redundancy analysis (RDA) relating the two plant-cover (N.a - N. aphyllum and P.u - P. urvelli) sampling locations along the two sites (CY – Cerro YPF; RA – Rincon Amarillo; CA – Campamento; EZ – Entrada Zaino; PP – Pampa de los Pjaritos; and ZG – Zaino Guadalosos), soil abiotic parameters (SM – soil moisture; OM – organic matter; WHC – waterholding capacity; and pH) indicated by dashed lines; and biotic parameters (MR – microbial CO2 evolution; CLPP – community-level physiological profile – substrate utilization) indicated by solid lines. 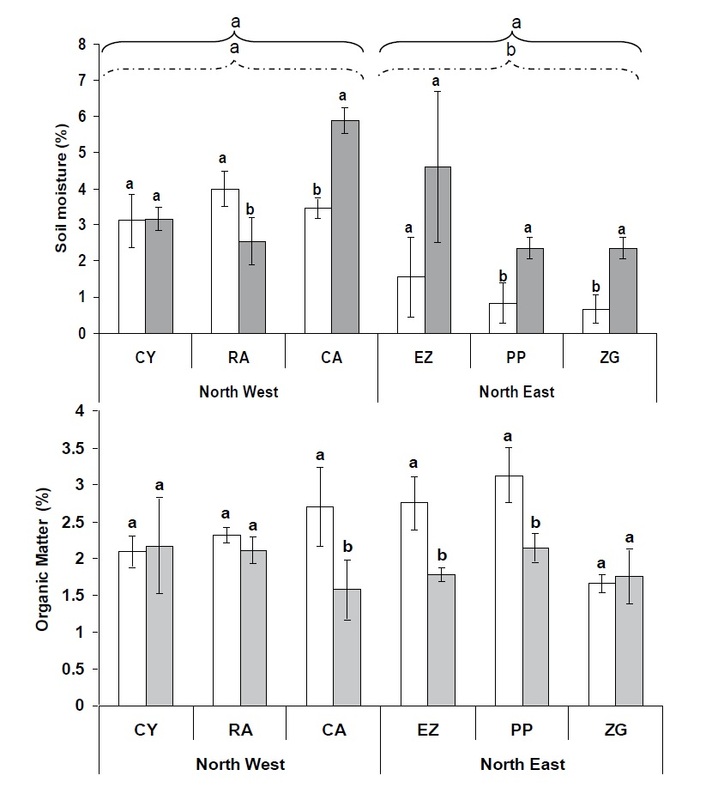 Figure 4: Redundancy analysis (RDA) relating the two plant-cover (N.a - N. aphyllum and P.u - P. urvelli) sampling locations along the two sites (CY – Cerro YPF; RA – Rincon Amarillo; CA – Campamento; EZ – Entrada Zaino; PP – Pampa de los Pjaritos; and ZG – Zaino Guadalosos), soil abiotic parameters (SM – soil moisture; OM – organic matter; WHC – waterholding capacity; and pH) indicated by dashed lines; and biotic parameters (MR – microbial CO2 evolution; CLPP – community-level physiological profile – substrate utilization) indicated by solid lines. The Shannon-Weaver index (H’) was used to measure soil microbial functional diversity, with the values fluctuating between 1.47 and 2.41 in the soil collected in the vicinity of N. aphyllum compared with the samples collected in the vicinity of P. urvelli, where values ranged between 1.47 and 2.28. No significant differences between the two plants were obtained. However, univariate analysis of variance (ANOVA) (Table 2) showed a significant location effect (p<0.0001). The results shown in table 3 highlight the importance of the environmental effect on the microbial community, and the interactions between them and extreme abiotic conditions. The microbial biomass, which is strongly correlated with organic matter availability and is also the food source for higher trophic levels, was found to be significantly related to all the components of substrate availability, with the exception of low significance to carbohydrate substrates. Redundancy discriminant analysis (RDA) produced a graphic illustration with arrows relating the biotic and abiotic variables to the sampling sites. Arrows pointing in similar directions indicate a positive correlation, while arrows pointing in opposite directions indicate a negative one. The longer the arrow, the greater the significance of the relationship. No significant trends were observed for sampling sites, which may be the result of relatively high soil heterogeneity. The two-plant species show opposite significance related to each other. N. aphyllum shows a closer relationship and affects OM and WHC, which is mostly represented by the PP (Pampa de los Pjaritos) site. All biotic components were found to be negatively (not significantly) affected by SM. All microbial activity such as MR, MB, and CLPP were significantly active at the RA (Rincon Amarillo) site, and very well correlated with the soil pH at the site. The RDA results presented in figure 5 exhibited four trends. First, the two sampling sites, NW and NE, as well as the two plants, N. aphyllum and P. urveli, show an opposite, similarly strong direction, elucidating the difference between the sites and plant species without habitat preference. Second, organic matter was found to be relatively strongly affected by N. aphyllum, accompanied by microbial biomass (MB) and, in some sense, by WHC, which is more related to the NE sampling sites. Third, microbial CO2 evolution, which can be seen to be correlated with soil moisture (SM) and soil pH, related to P. urvelli shrubs located at the NW sites, indicating a positive relationship between the variables, in contrast to OM and WHC. Fourth the CLPP (communitylevel physiological profile – substrate utilization level) was represented by a longer arrow than that of MB and MR, and was located between the two, elucidating the significance of the different abiotic and biotic variables found at the NW sites. Redundancy analysis (RDA) relating the two plant-cover (N.a - N. aphyllum and P.u - P. urvelli) sampling locations at the two sites (NW – northwest sites and NE – northeast sites) indicated by solid lines; soil abiotic parameters (SM – soil moisture; OM – organic matter; WHC – water-holding capacity; and pH); and biotic parameters (MR – microbial CO2 evolution; CLPP – community-level physiological profile – substrate utilization) indicated by dashed lines. 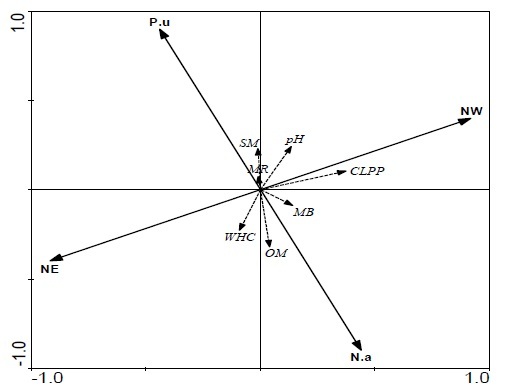 Figure 5: Redundancy analysis (RDA) relating the two plant-cover (N.a - N. aphyllum and P.u - P. urvelli) sampling locations at the two sites (NW – northwest sites and NE – northeast sites) indicated by solid lines; soil abiotic parameters (SM – soil moisture; OM – organic matter; WHC – water-holding capacity; and pH); and biotic parameters (MR – microbial CO2 evolution; CLPP – community-level physiological profile – substrate utilization) indicated by dashed lines. The guanaco L. guanicoe is one of the most adaptable wild ungulate grazers due to its use of environmental resources and resourceful food consumption . Their feeding activity plays and important role, similar to that of other mammals, as demonstrated by Roth et al. , in re-establishment of grasses and contribution to the stability of the vegetation in xeric environments. The L. guanicoe grazing activities, based on field observation (personal observation), are found to be similar to the behavior of jackrabbit browsing, leaving plant parts on the ground, thus contributing to feedbacks that maintain the system . The widespread recognition of the need to interpret processes on a multiple scale, where biotic components are re-examined with abiotic variables, yields a better understanding of the role and functions of all systems, especially a terrestrial xeric ecosystem. Microbial activities in desert soils are highly dependent on soil physicochemical characteristics, such as temperature, pH, moisture availability, and organic matter availability [20-24]. Desert ecosystems are mainly characterized by unpredictable rainfall in time, space, and amount, leading to lack of moisture availability, which strongly determines the vegetative cover as well as the soil biotic components. Moreover, topography, soil mineralogical and fraction concentration, which are part of the soil milieu, play an important role in generating ecological niches with uncountable combinations between abiotic and biotic components. These interplays determine microbial-community density and composition for culturable and nonculturable inhabitants. Topography in xeric environments is one of the main factors influencing the microclimate and generates a diversity of ecological niches with uncountable combinations between temperature, solar radiation, and soil moisture availability. The interplay between primary production and a soil biotic community is governed by above- and below-ground grazers that contribute to organic-matter availability and distribution for biochemical cycling – ecosystem balance [25-28]. In the present study, both plant-cover study sites showed a strong heterogeneity in most abiotic parameters. Soil moisture, as well as organic matter, were found to be the two main factors determining a soil microbial community. Significant differences in soil organic matter in the vicinity of desert perennials, as found in other studies conducted in desert systems, were linked to plant ecophysiological adaptation [23,29,30]. Moreover, Berg and Steinberger , Rodriguez- Zaragoza et al. , Garmendia et al. , and Barness et al. attributed the difference in soil organic matter in the plant vicinity to the relatively high performance in annual plant productivity beneath shrubs compared with open areas, supporting Garner and Steinberger’s assumption that perennial plants create ‘islands of fertility’ that will determine microbial activity. Studies performed in the past determined that, in addition to environmental parameters, soil parental material, soil type [36,37], and pH  are among the most influential factors affecting a soil microbial community. The present study elucidates the importance of soil pH in a microbial community, shaping (correlated) microbial CO2 evolution, microbial biomass, as well as amino acid utilization and activity, and functional diversity. Based on multiple carbon-source substrate utilization, the CLPP values yielded data related to the whole soil community, reflecting the composition of functional groups in the soil at the different sampling locations and sites. Direct comparison between the substrate utilization an sampling sites was found to have a discriminatory ability to compare the samples collected in the vicinity of plants and at the different sites, as shown by Chapman et al. . Multivariate analysis showed an understandable distinction between the sites that can be related to the soil pedological, physicochemical feature. One of the substrates that was to be significantly utilized at the NW sites was carboxylic acids, which not only stimulated soil microbial activity but also increased soil microbial-community functional diversity, although the pH of the soil was found to be similar at the different sites. These results were found to be different from Wang et al. results, who showed, in a simulated study, that low pH (in the range of 5.0) significantly increased the microbial substrate utilization of carboxylic acids, carbohydrates, and amino acids. RDA analysis showed that soil physicochemical components affecting soil type play an important role in determining a soil microbial community, followed by changes in utilization diversity of carbon sources (carboxylic acids, carbohydrates, amino acids, and aromatic acids). The relatively high utilization of the three carbon (carboxylic acids, carbohydrates, and amino acids) sources, and the difference in the ratio between them, are, at present, complicated and difficult to explain, although preliminary explanations can be related to the soil substrate, plant ecophysiological adaptation, trampling activity, soil particle ratio (silt, clay, sand) at the different sampling sites, etc. McGuire and Treseder , Allison et al. , and Carmey et al. emphasized the importance of microbialcommunity composition and dynamics as related to environmental effects. Despite the number of studies regarding microbiome, environmental plant-cover feedbacks , the significance of microbial community exploitation of accessible substrates, and their utilization in xeric environments remain unanswered. The importance of understanding in what way microbial functional responses will be affected in a heterogeneous soil natural environment cannot be overestimated. Significant differences in CLPP indicate that plant cover has a significant effect on the rate at which particular organic compounds are degraded. Differences in physiological profiles between the soil samples in the vicinity of plants were mainly due to the quantity, versatility in plant pruning, and chemical composition of the plants. Further research involving the quantitative measurement of L. guanicoe alteration between grazing, browsing, and carboxylic-acid concentrations in the litter during decomposition, as well as determination of the taxonomic structure of soil microbial communities, is needed to elucidate the mechanisms and contribute to understanding the stability underlying differential carboxylic-acid responses in soils in different systems. Our study showed a soil microbial community that fulfils many functions in a terrestrial ecosystem, with an interplay between soil heterogeneity, plant cover, and grazing activity. In such a system, in which there is interaction between abiotic and biotic factors, a microbial community can be used as one of the main bioindicators of soil functionality across land-use types. The authors thank the Department of Natural Resources of Mendoza Province for issuing the relevant permits to perform research assignments in the La Payunia nature reserve. We also acknowledge with thanks the collaboration of D. Panebianco for providing logistic field work support, and the students of the National University of Comahue (Settlement San Martin de los Andes) for their assistance during the laboratory analysis of samples. Special thanks to Ms. Sharon Victor for her useful comments and preparation of the manuscript for publication.